For many years I've bleached the heck out of things around here. As well as used it to whiten (or attempt to) my white laundry. I've bleached everything from the tub/shower and toilet and my floors. You might think, "Here she goes again". But I'm not attempting to be a broken record. Rather I'd like to offer alternatives and let you choose. Specifically today my focus is on using bleach or not. My mom at 70+ years old still cleans houses for people and usually the elderly. She hasn't necessarily taken me up on alternatives I suggest but she does use less toxic chemicals these days. I'm thankful! I think how I've been affected, my kids, grandkids and how elderly are affected by the toxic chemicals we have cleaned with. It can't be a surprise to most how corrosive and dangerous bleach is. Our children, the elderly, and those with conditions such as asthma and COPD can really have adverse reactions to it. 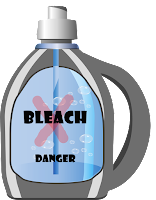 Even a person or child without any illness can suffer mucous damage from bleach. I could quote you research to prove how dangerous bleach is if you'd like but I'm hoping this time around common sense and reason might be enough. You can search over 2000 products with their current status and rating. Items are rated on a scale from A-F.
F = the most toxic products. Did you know mixing chlorine bleach mixed with ammonia can create a deadly gas. And further if one mixes dish soap with bleach it can cause a mustard gas used in chemical warfare. I could continue to share some of the negative and scary effects of chlorine bleach but I'll stop for now and offer you an alternative that won't harm you or anyone. 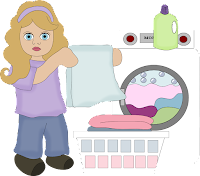 In addition, you don't have to burn your nose hairs from the smell to clean or do laundry. 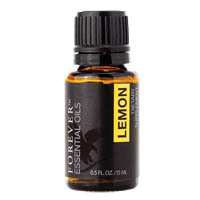 Lemon Essential Oil has so many awesome properties for use in cleaning, disinfecting and freshing the air, clothing, etc. And doing it without harmful chemicals. Order the remaining ingredients/supplies below the instructions. I am an Amazon associate so your purchase does help keep the lights on the fire burning. 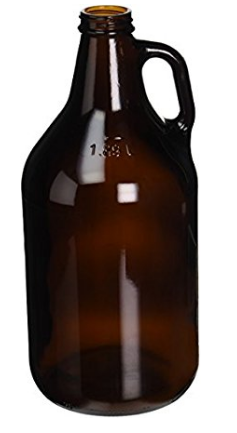 Fill the gallon jug half full with purified water and add the Peroxide, Lemon Juice and Essential Oil. Cap the bottle, mix and add remaining purified water. Don't fill quite to the top so you can recap and shake to mix again. Please do let me know when you make this, how your liking using it and ask any questions if you need help too. I'll be sharing more recipes I'm trying as well very soon. Here is a pdf if you'd like to download this with the links to your computer.